Think about it humans! 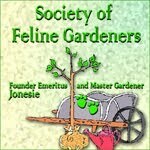 Often times we hear you that you would like to be a cat, could you really be a cat and maintain our standards? We are sending comforting purrs to Pikku Punapipuri, Stran was helped to The Bridge this weekend. We will miss the big guy. We had a marvelous weekend. Mum says it is likely to be the last of the really nice weathers and the weather guessers say it will be cooler this upcoming week. Mum kept the windows open and we enjoyed having them open. Derby snoozing in the front window with Ducky joining him. Come on mum, open the window! She did. Later Ducky enjoying the big windows that go to the floor which was wide open. Mum was outside enjoying the outside and getting ready to grill. Grilling, yep we got tastes on both Caturday and Sunday. This was Caturday's dinner. Grilled bacon wrapped pork ribeye. YUMMY. We were really nice waiting patiently on the window ledge until mum gave us our share! The Packers - Well Packer fans, the world can relax just like ARodg said. The Pack beat Da Bears and all is right with the world. Short turn around, they play Thursday against the ViQueens. The Bronco's - They got the week off! Happy Caturday to All. We are having a wonderful day, bright, sunny, warms, so that means the windows are open for us. We got things off to an early start, waking mum up before the sun rose up today! So she got up, and moved to sleepily watch out the big windows that go to the floor. She even went outside in her jammies to fill the fevver feeders. Thankfully, no one went by on the trail to see her! We decided to share the leopard pillow this morning for a bit. Yeah, we do get along and share sometimes. But we usually are a bit more independent. 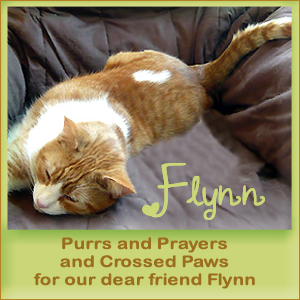 Sending lots of purrs to our YouKay buddy Flynn. He is doing poorly and his beans are worried. Well, the season of fall has arrived and yes it is beginning to show in the trees around here. Not much yet but our big maple is getting just a bit more color on one branch. A close up shows it even better. Mum says as she walks and drives around, things are not the GREEN they have been, but now just starting to get a touch of yellow or gold. The sedums have turned bright pink. This plant is one that mum saved from the destruction last year and she put it back where it was. Guess it like it there! The the fevvers, the bright yellow male gold finches are starting to molt and get there duller color for the winter. Mum says they are eating the seeds like crazy, so she wonders if that means it will be a bad winter. She hopes not! 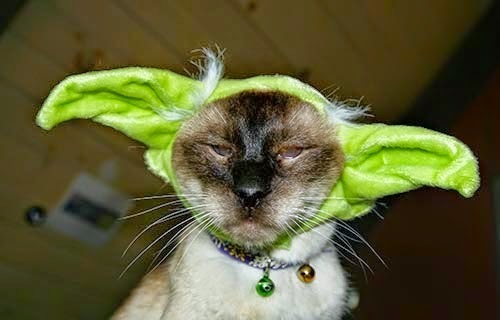 Hohum, it is Monday. Mum is going back to day hunt after a long weekend. She took off on Friday, which was a marvelous day, warm and sunny. That also meant we had open windows during the day. Sunday morning I had a good nap going on when mum came around with the flashy box. Plus she wanted to put the bed back together for herself. Good job mum. It didn't take you furrever to put the bed together, now I can get back to my nap. Plus we hung out with mum while she watched feetsball. The good news is she didn't do much yelling. The bad news is that the game wasn't that interesting to watch for us. I put my backside towards the moving picture box. Ducky snoozed on top of mum! The Pack - hope they have a good ventilation system at Ford Field, the Pack stunk the place up losing to Dee-troit. Mum is already thinking that this won't be their year. Next week is Da Bears. The Broncos - well, mum didn't watch the whole game. Peyton did manage to get it tied so it went to overtime, but then The Broncos lost in OT. Happy Caturday morning. Ducky here. 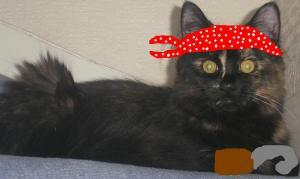 Derby and I had a blast yesterday with pirate day. We enjoyed sailing the seas and seeing our furiends doing the same. Too bad it is only one day a year we do this. I am having a wonderful morning so far. Firsted I woke mum up and snuggled with her and then walked all over her too. These first three I am under the covers with mum. I love doing this and I gets lots of loves from mum while I am snuggled with her. Time to move, sorry for the blurry picture! Then I 'acited to explore the top of the covers and then sit on mum. That way she could spend more time in bed resting. Mum's hip, always a good place to park myself. Hope you are comfy mum, 'cuz I sure am! Yes, just stretch out and relax, draping myself from her ribs down over her hip. My let's look alert now photo. Told mum it was time to get up and she did. Fed us our brekkies, then readed the paper. Now off to run some errands. Meowrrrg. 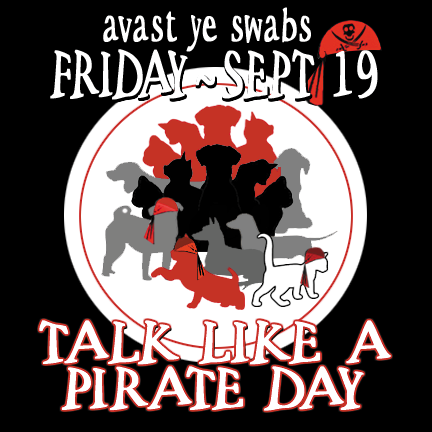 Welcome to Pirate Day! 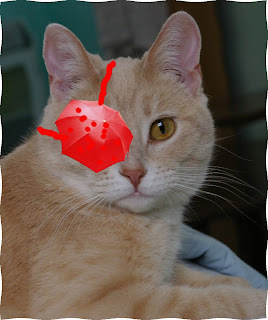 We be getting ready for our annual sail on The Good Ship Sassycat! So join us, Captain Derby, First Mate Ducky and First Wench Dora on our journey on the wide blue sea and into the unknown. 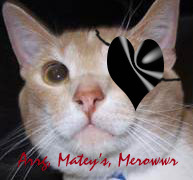 Iffen ye not be prepared to party with us, you will be walking the gangplank of the Good Ship Sassycat. 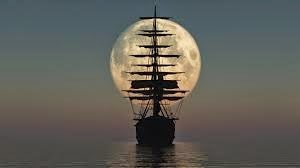 So come aboard if ye dare and host some grog to toast the pirate brigade. ARRRGGGHHHH. We have been on butterfly alert. Have been seeing a few more flying around in the past month. That is good. The pictures are from our neighbor's yard. 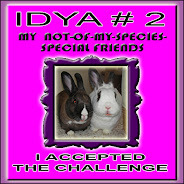 Mum got picture there, we have seen butterflies in our yard, but mum hasn't been able to get pictures. Plus she saw lots of Monarch butterflies at the race track last weekend. So while they may not be in our yard, they are around. Fall is coming, we have had some cool days, now warming up again. Mum says they are starting to harvest the corn from the fields. That is all. Love Virginger and Glimmer. We have lost another original, Maobert Schnickles. He ran off to The Bridge on his late brofur's, Skeezix's, purrthday. 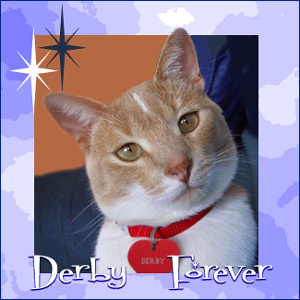 We send comforting purrs to his family, Buckaroo, The Food Lady and Mr Tasty Face. Have fun reuniting with the gang at The Bridge. We will see you again someday. Cat rule: Don’t bite the hand that feeds you; just bite the one that won't feed you fast enough. Thanks to every cat that showed up for the house trashing. Mum did comment that the house seemed messier than usual. We also give kudos to whomever yakked on the kitch-hen counter! When mum got home on Sunday, we watched the rest of the Packer game. Sitting on her if necessary to get our loves and treats. Derby giving her the evil eyes, to get more treats. So yeah, mum played with old racy cars, some of which she amembers from way back from when they were new, like first one below. It is a Formula V with a Lynx chassis. A kittie car! A paw print on the front. Some had a lynx head on their cars too. Now the next ones mum did not see race when they were new, they are from before she was even born.But our UK furiends and their beans will enjoy these MG's. Now the next is a Sunbeam, another UK car, but mum was told it has a super special engine. Mum was told this engine is an engine from a Spitfire airplane from the WW II era! This car was not taken out on the track, it just was in the tent for showing it off. The Bronco's - Mr Peyton won today too. Mum didn't see any of the game.